Underwater positioning and navigation specialist Sonardyne International Ltd. has launched a new integrated acoustic and inertial positioning platform for marine survey contractors and offshore construction companies. Available from today, Sonardyne’s Fusion 2 Long BaseLine (LBL) and Inertial Navigation System (INS) software has been written from the ground up to offer a single solution aiming to make field development projects faster and easier. With Fusion 2, the separate software applications, vessel-fit hardware and often complex communication interfaces that have been typically required to support LBL, acoustically-aided INS and Sparse LBL operations, have been replaced with a single, unified solution that is easier and faster to set up and run. Live in-water preview events held in the run-up to today’s launch in Singapore have provided audiences with the opportunity to experience first-hand how Fusion 2 will impact offshore campaigns during the 2019 offshore season and beyond. One of the benefits demonstrated is the ability to undertake the real-time SLAM (simultaneous localization and mapping) calibration of a sparse LBL transponder array while you survey – until now a lengthy offline post-processing activity. Significantly reducing survey time is central to another key innovation that arrives with Fusion 2. Sonardyne has reengineered the digital signal processing protocols used by Fusion 2 to command and control seabed arrays of its Compatt LBL transponders and vehicle-mounted ROVNav transceivers to Wideband 3. Wideband 3 allows, for the first time, sensor data (e.g. pressure, depth and temperature) from a Compatt to be to be embedded with navigation (ranging) telemetry data. This will have a big impact on operations such as structure installation, accelerating update rates by a factor of 10 and eliminating issues operators currently face with latency. To benefit from Wideband 3, Sonardyne has advanced its sixth-generation subsea hardware platform, with Compatt 6 and ROVNav 6 instruments now designated as ‘plus’ units, supplied as standard. To protect customers’ investments, these are backwardly compatible with existing inventories of Compatt 6s, which can also be upgraded to realize the potential of Fusion 2. Fusion 2 is being rolled out in two releases. The Fusion 2 INS pack, released today, delivers LBL aided operations using Sonardyne’s SPRINT INS technology. The second release, due in Q2 next year, will deliver the full acoustic LBL package. 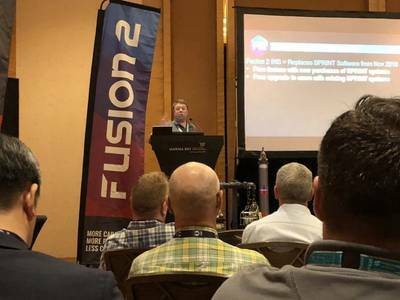 The Fusion 2 system works through Sonardyne’s Navigation Sensor Hub (NSH), which also supports the company’s Ranger 2 USBL system, so users will need fewer systems in their inventory and on board their vessels.